You'll feel like a living fairytale Princess as you walk down the aisle in this graceful, elegant dress! The color of this dress is Ivory/Champagne and it has a dramatic ruffled skirt with a chapel train. It also has gorgeous corset detailing with beaded venice lace appliques. It was strapless , but there were 4 small lace straps added, that can be removed easily if needed. The dress size tag is a 6, but the corset has been altered to fit a size 2-4. My seamstress also added many hidden ties to hold up the train after the ceremony. It does have a back zipper. The dress is heavy, but oh so worth it. If it fits like it did me, your hips will bear most of the weight. I absolutely loved every second of wearing this dress. It will gracefully handle any dance move you throw at it... especially the YMCA. 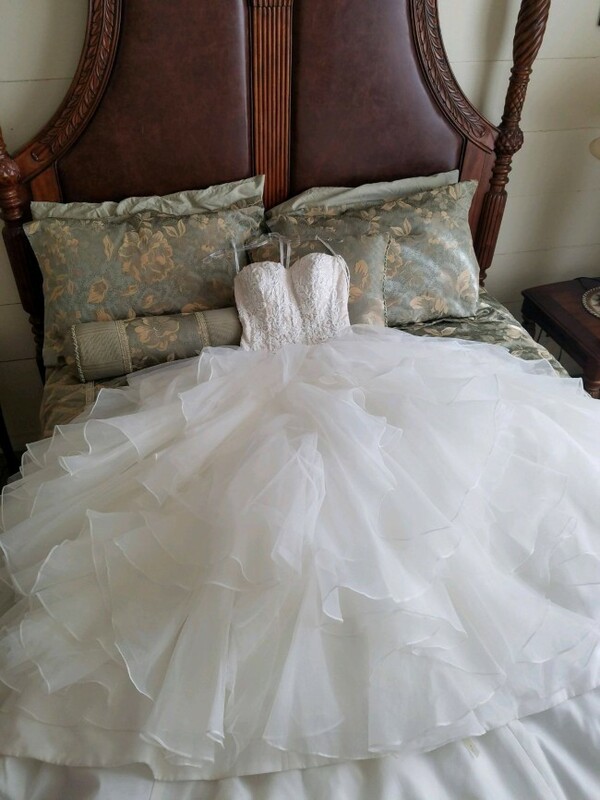 Dress is dry cleaned and ready to be worn for another happily ever after fairytale. 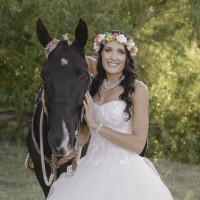 I cant wait for another bride to feel as amazing as I did in this beauty! Contact me with any further questions or details. Final Sale-No Returns. Corset was altered to fit a size 2-4. Bra cutlets/padding & 4 beautiful lace straps sewn on, but could easily be removed if needed. Multiple ties were added to easily hold up the long flowing chapel train when it is time to dance!